Galeria Posibilă and the AnnArt Gallery invite you to discover a new story about inherited cultural values: the royal harpsichord from Peleș National Museum was made in Antwerp, in 1621, by Andreas Ruckers, but acquired its Parisian name and appearance thanks to Pascal Taskin, who restored it a century and a half later. Initially belonging to the French royal family, it would later find a new home at Peleș Castle, where it would occupy a special place in Queen Elizabeth’s heart. Today, this musical instrument appears under “treasure” category on the National Heritage list. The fascinating history of the Ruckers-Taskin harpsichord from Peleș National Museum begins in Holland, at the start of the 17th century. The work of Andreas Ruckers, the instrument would appear to have been completed in 1621 in one of the workshops of Antwerp. Famed harpsichords makers, the members of the Ruckers family were undisputed leaders in the field throughout the 16th and 17th centuries. After a more than a century and half of use, owing to its inestimable value, the harpsichord was sent for restoration to the workshop of the famous Parisian piano and harpsichord maker Pascal Taskin. The latter brought the instrument back to life, transforming it into a French harpsichord with two manuals and four registers. Like his fellow instrument makers Nicolas Blanchet and Henri Hemsch, Taskin applied the procedure known as ravalement typical of the French school of harpsichord making. The procedure involved the transformation of valuable instruments of the Flemish school built by Ruckers or Couchet into French harpsichords. These Flemish-origin instruments were highly valuable not only on account of the quality of their sound, but also their painted decorations by leading 17th-century fine artists. If an 18th-century Blanchet or Taskin ravalé harpsichord originally bore the signature of Ruckers as well as of Johannes Vermeer, Jan Steen or Gerard ter Borch, then members of the French royal family would happily pay as much as was necessary to purchase this instrument. The instrument was initially in the possession of the French royal family and belonged to Madame Élisabeth (1764-1794), the sister of King Louis XVI. In 1879, it was purchased by Felix Bamberg for the collection of Romanian king Carol I, thus finding its way to Peleș Castle in Sinaia. The instrument is currently in a precarious state. Some parts are at risk of being destroyed altogether due to effects of insects and mold. Leaving it in its current state would compromise any future attempts at restoration. Moreover, besides the fascinating history of the object, the restoration initiative launched by the Antiqva Association also shines a light on present-day practices in the conservation of cultural heritage through the involvement of a team of international and Romanian experts. Thanks to the restoration project, the Taskin harpsichord, which has been silent since the start of the communist period until the present day, will soon be admired and listened to once more. Apart from the restoration per se, the project also involves the creation of a photo album and documentary film, recordings of baroque music and public demonstrations of the instrument, and the performance of a number of harpsichord concerts by leading European harpsichordists. One of Romania’s few historical musical instruments is about to be brought back to life. The Antiqva Association has made a serious commitment to restore the wonderful Ruckers-Taskin harpsichord from Peleș National Museum. Listed under the “treasure” category on the National Heritage list, this ancient harpsichord will soon regain its former glory through the Taskin Project. The first steps in this respect were already taken in 2015, when restoration experts examined the state of the instrument and made proposals for its conservation. The time has come for all of us to demonstrate our love for this gem of a musical instrument neglected by time and people. Upon completion of the restoration project, we and future generations will be able to enjoy the visual and auditory beauty of the Ruckers-Taskin harpsichord. The newly-restored harpsichord will inspire exhibitions, concerts, audio recordings and new stories that themselves will become part of history. 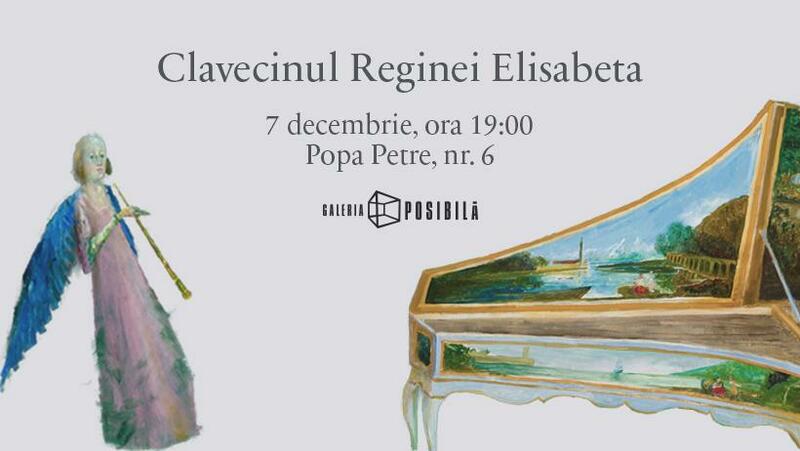 The painting will be on display at Galeria Posibilă until 19 December.